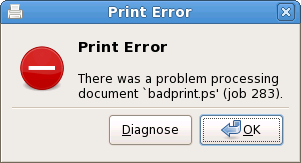 I’ve just added print job failure alert messages to the system-config-printer applet, and this is what one looks like. Part of the work involved in doing this was to switch from repeatedly polling the CUPS server for the entire job list (which can be slow and resource-intensive) to using IPP notifications to find out what’s changed. Here are some screenshots of the new trouble-shooter in system-config-printer. The actual framework is not specific to printing or CUPS at all, but provides a way of stringing together question screens while collecting diagnostic output along the way. I’ve added a simple trouble-shooting mode to system-config-printer in version 0.7.80. It’s not very sophisticated, but I hope it will be useful. It is a “wizard”-type dialog with forward and back buttons, and the Python source code allows for question screens to be slotted in fairly easily. If it can’t work out the problem it will display some diagnostics that could be useful to attach to a bug report. To try it out, hit F1 or select Help->Troubleshoot from the menu. You are currently browsing the PRINT HEAD weblog archives for February, 2008.